Every year, Philadelphia-area residents celebrate Mother's Day by practicing some activism to gather support for breast cancer awareness. 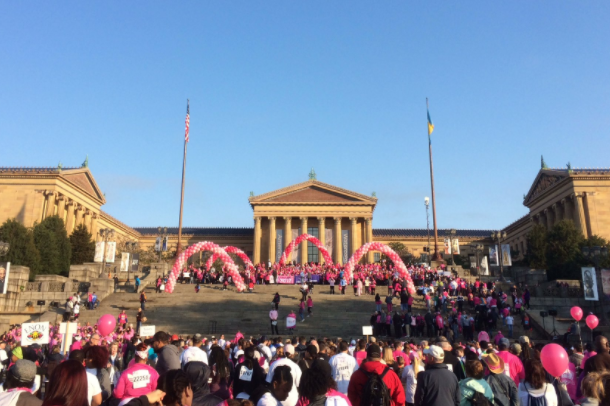 On Sunday, thousands answered to call to participate in the Susan G. Komen's 27th annual Race for the Cure along Eakins Oval near the Philadelphia Museum of Art. Ceremonies began at 7 a.m. Following two days of rainy weather, the sun was shining as breast cancer survivors, men, women and children donned pink clothing to fight for awareness, funding and effort to save those diagnosed with the disease. The event featured the Survivors Parade of Pink as breast cancer survivors walked down the Art Museum's steps. Other activities included a 5K run, a 5K walk, a 1-mile fun walk and a kids race. Komen Philadelphia has raised more than $57 million in grants to benefit local organizations. Happy Mother's Day!Started off with a race for the cure.